Ashpit Cottage in Little Barugh, near Pickering, North Yorkshire sleeps 2 people. Nestling in the sleepy hamlet of Little Barugh, this beautifully converted Grade II listed former farm building, awarded Visit Britain’s 5* Gold quality grading, lies adjacent to the owners’ farmhouse. The cottage enjoys its own patio with extensive views overlooking the garden and wildlife pond towards the Hambleton Hills. Step back in time and enjoy a trip on the famous steam railway from Pickering to Whitby. York is not to be missed, with its cobbled streets and cafés. Shops 5 miles, pub 1 mile. For a better idea of where Ashpit Cottage is, you can see Ashpit Cottage on the map below. 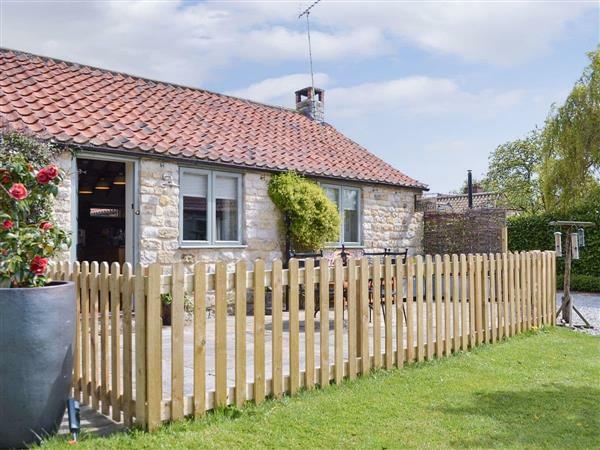 Ashpit Cottage is in North Yorkshire; should you be on the lookout for a special offer, you can find all the special offers in North Yorkshire. It's always worth checking to see what is on offer at the moment. Do you want to holiday near Ashpit Cottage (IUN), you can see other cottages within 25 miles of Ashpit Cottage; have a look to find your perfect holiday location.